A lot of things have happened this year and 2012 has been full of changes for me. I’ll probably do a proper stock take of everything at the end of the year but today I thought I’d write about one of the more frivolous changes this year: my hair (yep, it’s a frivolous post today – I blame the hot, sunny and downright cheerful weather!). I’d been stuck in a hair-rut for, oh, quite a few years! At the ripe old age of 13 I decided that blondes had more fun and so began 15 years of highlighting my natural mousey locks ever-increasing shades of platinum. The cuts have changed (everything from an ill-advised bob to the ubiquitous ‘Rachel’ haircut in the mid-90s*) but the colour has by and large remained the same. I didn’t put too much thought into having it done. I decided I wanted a change and so I switched from blonde to red. And I loved it. Dark red on top with magenta tips. It was a big, bold colour and people couldn’t help but comment on it. Everyone (except my mum, who just doesn’t understand why I would want to be anything but blonde) liked it and for the first time in my life strangers would compliment me on my hair. But there was a downside. Red hair dye is the hardest colour to keep in your hair and it fades super-fast so every six weeks I was back in the hairdresser’s chair to have my roots touched up and my bright magenta ends brought back to life. It didn’t seem to matter which colour care regime I tried (and I tried a lot, from the eye-wateringly expensive Aveda Colour Conserve range to the more purse friendly Avalon Organics), nothing stopped the fade from bright red to bleached ginger. Red hair also runs. Pillows, duvet covers, towels and clothes all ended up covered with spots and splodges of red. The final straw came when I went for a run and came back looking like an extra in a bad horror movie with streaks of red running down my face and neck (and I wondered why fellow runners were giving me such strange looks!). 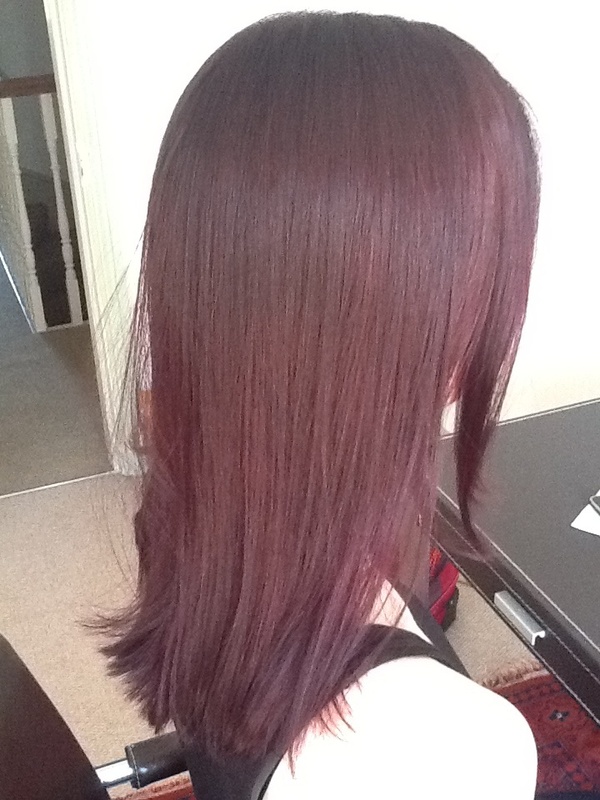 Yes, I’ve gone to the dark side and my hair is currently pretty much the same colour as a plum. It’s a very dark, slightly gothic and fairly dramatic colour. It’s also taking some getting used to but I like it. I’ve a sinking feeling that it will fade pretty fast too and in six week’s time I’ll be sporting a purplish-reddish collage! The next step will be to add a lighter, chocolate-y brown into the mix to try and get a more brunette look. I mentioned to my friends this week that I was going to dye my hair again and get rid of the red. 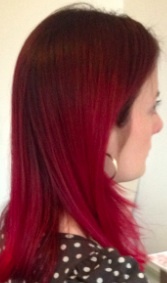 One friend - Jen - commented that she hoped the change in hair colour wouldn’t change my personality. This made me think: this year I’ve been through the colour spectrum: blonde, red and soon-to-be brunette via plum! Are the stereotypes true? Does my personality change to fit in with the clichés about each hair colour? Did I have more fun as a blonde? Was I more sweet and innocent with lighter hair? Was I feistier as a redhead? Will I be more intelligent and mysterious as a brunette? (I’ve no idea what the clichés are about plum-haired women!). Hmmmmm…I think I can safely say that none of the clichés fit. My personality has been pretty much the same with each colour. I was still super-sarcastic as a blonde and definitely had introspective, shy moments as a redhead. I’m fairly sure my IQ won’t suddenly improve with the addition of some brunette dye. I’ve been thinking about hair colour from a different perspective: I want to find a colour that matches my personality – a colour that adapts to me rather than the other way round. Have I found it? Almost. Red was definitely a better fit for my personality than blonde ever was. Purple is certainly going to be fun for the next six weeks but it’s a bit too gothic to become a permanent fixture. Which leaves the brunette spectrum. Chestnut? Chocolate? Mahogany? I think my perfect colour just might be in there somewhere! *I didn’t actually ever have a ‘Rachel’ haircut. I did ask my hairdresser for it when I was about 15 but, thinking about the mullet disaster I ended up with, I can only assume that said hairdresser had never seen Friends!